Universalis Tabula Iuxta Ptolemaeum - MERCATOR,G. Title : Universalis Tabula Iuxta Ptolemaeum. Size : 13.4 x 18.5 inches. / 34.0 x 47.0 cm. 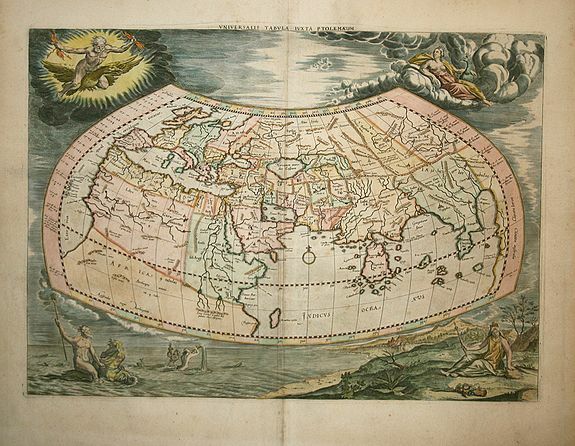 Description :This decorative map of the ancient world is the revised second state of Mercator's1578 Ptolemaic world map. The border was re-engraved, surrounded by allegorical figures representing the four elements of Fire (Zeus), Air (Hera), Water (Neptune), and Earth (Gaia), rather than the strapwork and windhead border of the earlier edition. There is a very large Taprobana (modern day Sri Lanka) in the Indian Ocean and the Indian subcontinent is severely truncated, though the Ganges is noted. Only the northern part of Africa is shown with the Nile originating in the twin lakes south of the Equator in the Lunae montes (Mountains of the Moon). Condition : Little minor toning. A hand contemporary to the map has added some numbers in ink to some central cities in the map.